An anniversary is defined by books as a celebration of a particular event as it reaches a year older. These events range from weddings, deaths, the founding of an establishment, and many other events that are worth commemorating. When an anniversary celebration is hosted, it will usually be attended by a big number of people, unless the celebration is intended to be private. But regardless of the celebration will be a public one or not, the organizers should always make use of an invitation to help spread the information and details to others. 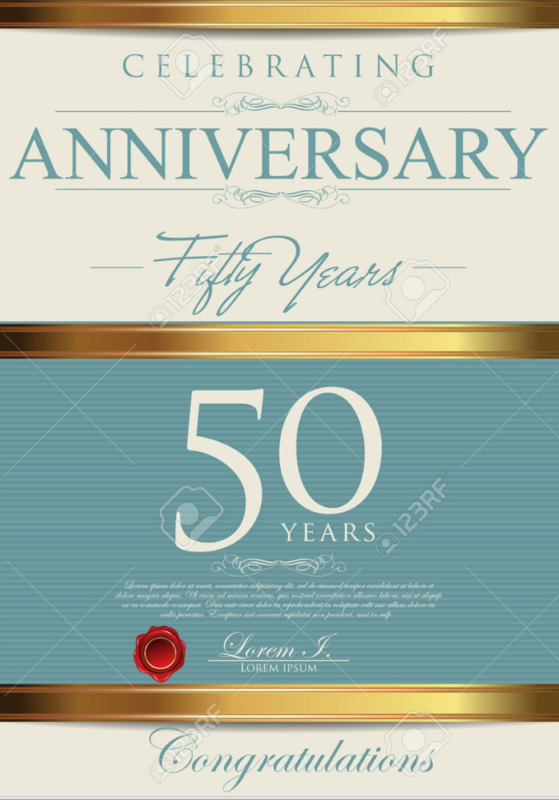 On this page, we have a collection of some of the most attractive and visually appealing anniversary event invitation designs that you can find on the Internet. With these invitation designs, you will save yourself the hassle in having to make one from total scratch, you simply need to download and customize the design according to your preference. Not bad, eh? Go ahead and check out the designs below. 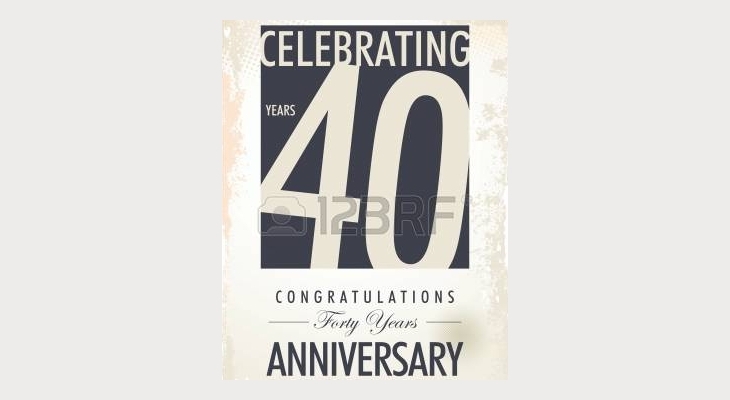 You may be able to find one that works for the anniversary celebration that you are planning. To start with here is a wonderful and colorful anniversary invitation design that is sure to grab the attention of the invitees. This invitation design maximizes its use of flower patterns and for both the background and the foreground features, which includes the lower corner borders, and some of the text written on the design. If you are planning to have a floral theme for your celebration, then the design above may be the ideal choice to go with. 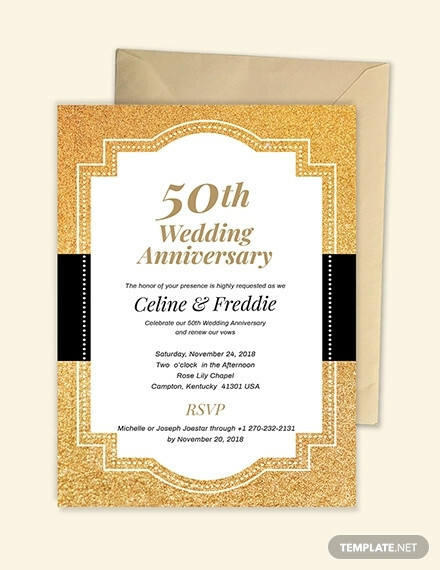 If you want your anniversary invitations to take inspiration from those found in Broadway shows in the past, then this vintage-inspired may be a perfect choice. 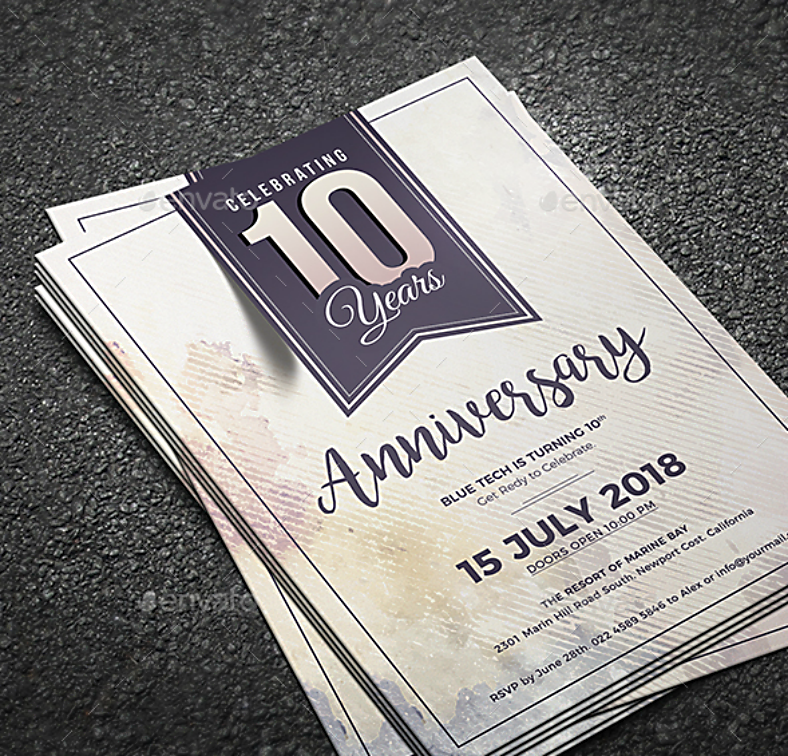 As you can see on this design, it mainly focuses on the typography and emphasizes the number by enlarging it since this is an anniversary invitation, after all. The background is a plain solid color and the elements on this design that give enhancements to the design are the abstract lines and the decorative borders around the edges. Aside from vintage designs for anniversaries, we also have vintage wedding invitations available here. 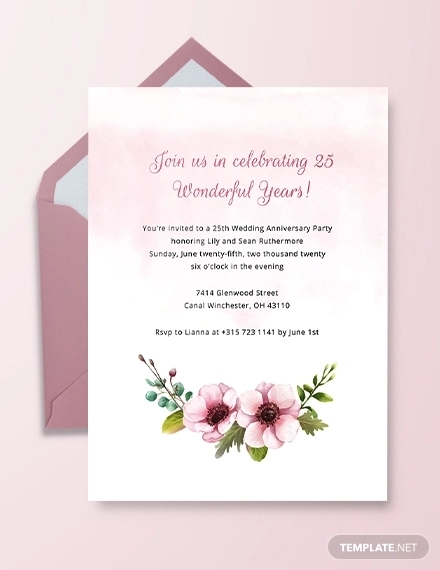 If you are looking for invitation designs for other types of events aside from just wedding anniversaries, the one above may be the one that you are looking for. 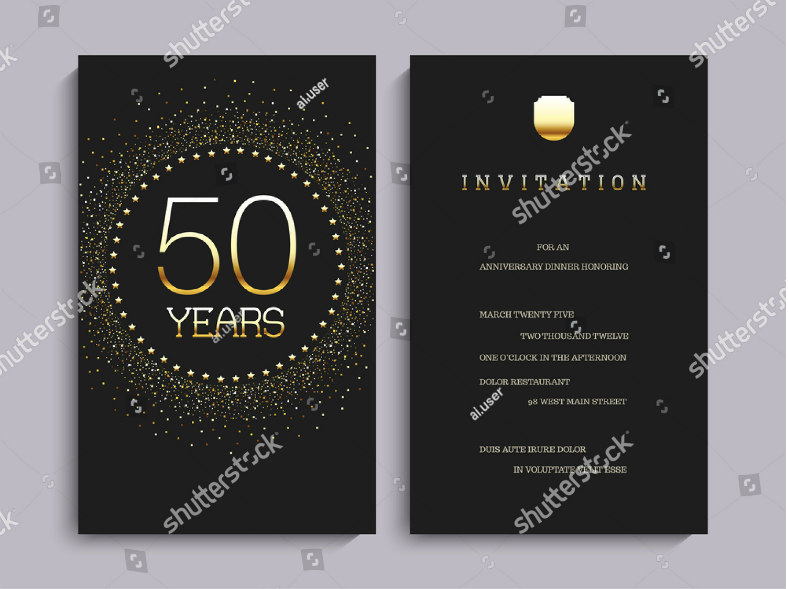 This invitation design is perfect for annual celebrations of the founding of an establishment or similar types of events. 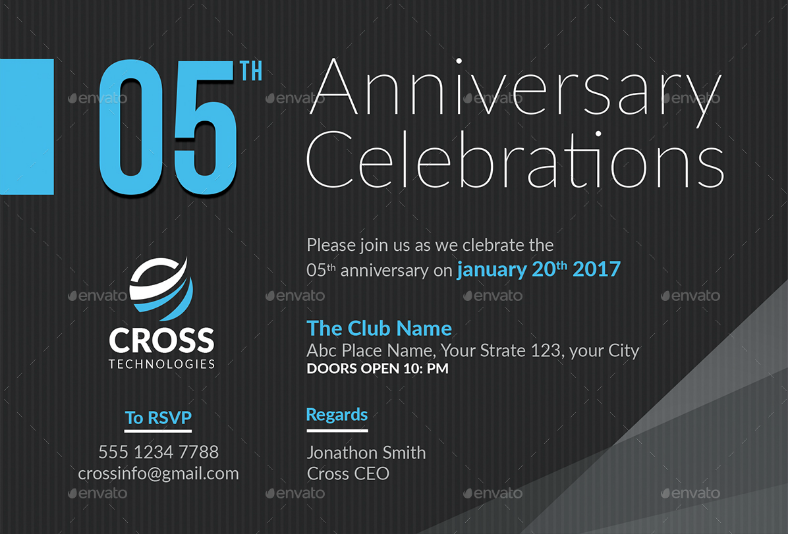 If your company is about to celebrate its anniversary, then we would recommend that you download the invitation design above. 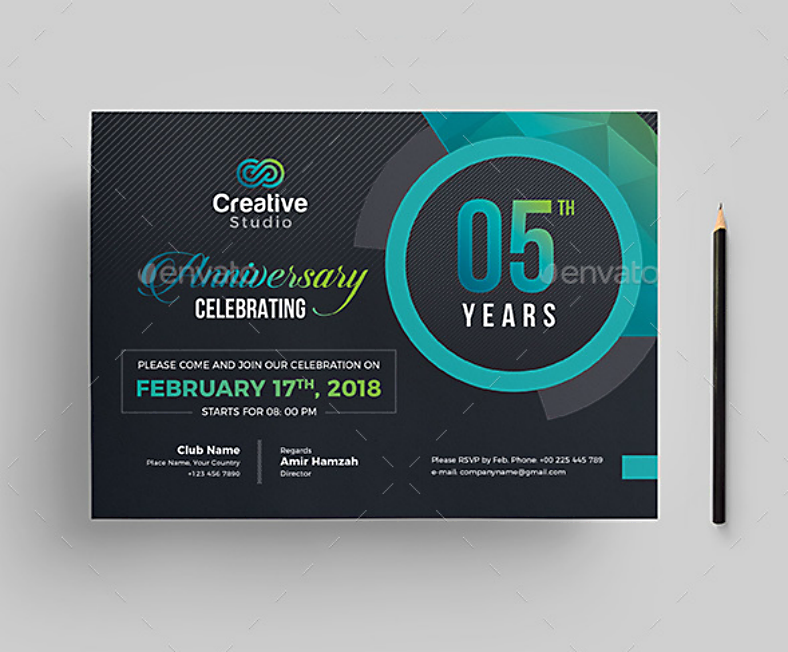 If you want an invitation template wherein you can choose between a vertical or horizontal orientation, then the design above may be what you are looking for since it gives you the choice whether to have a landscape or portrait type of anniversary party invitation. With this design, all the important information can be found on the left half of the design while the right half is saved for providing the reader with other supplemental information and additional features to enhance the quality of the design. 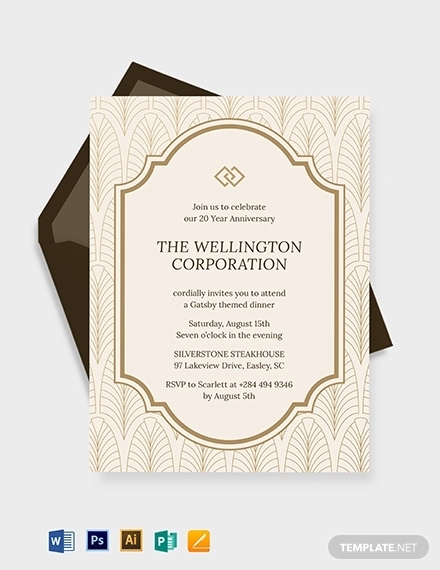 Make use of the negative space with this retro-inspired anniversary invitation design. For this one, only two colors are being used for the design’s color scheme, with the darker color being the one used for writing the details of the event. With regards to the number of years being indicated on the upper half of the design, the colors are switched with the dark one used to illustrate a solid square and the text written using the square’s negative space. 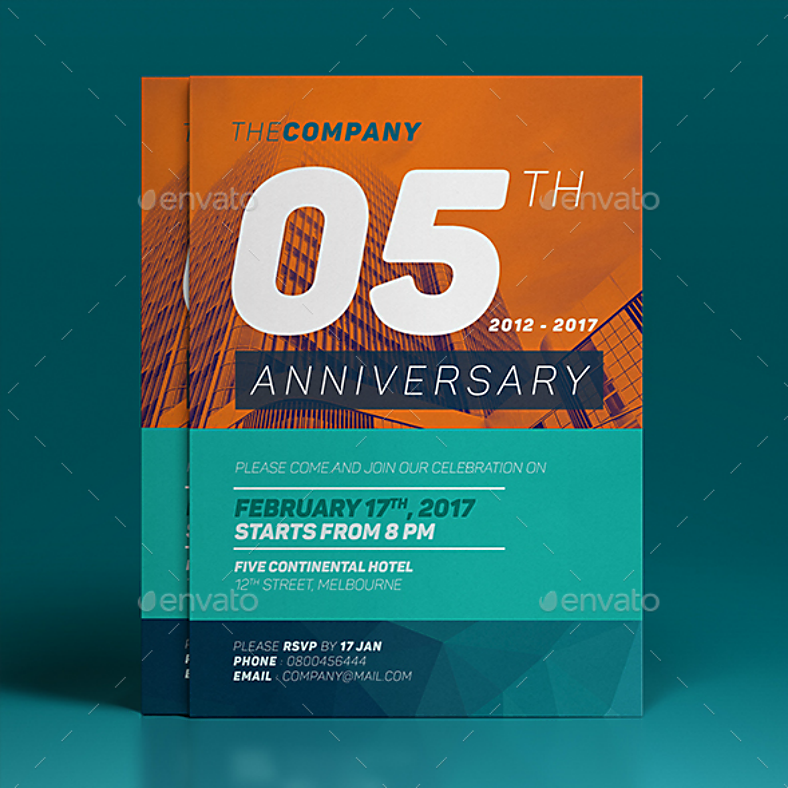 If you want to ease up on the use of colors for your anniversary invitation design, then you will probably love the one that we are showing you above. For this formal invitation design, only two colors are used, which are able to contrast each other. Even with the minimal use of colors, the features on the design are still able to stand out, and if you look at the ribbon-like element on the upper portion of the design that bears the number of years that the company is celebrating, it has a shadow effect that gives it a three-dimensional appearance. 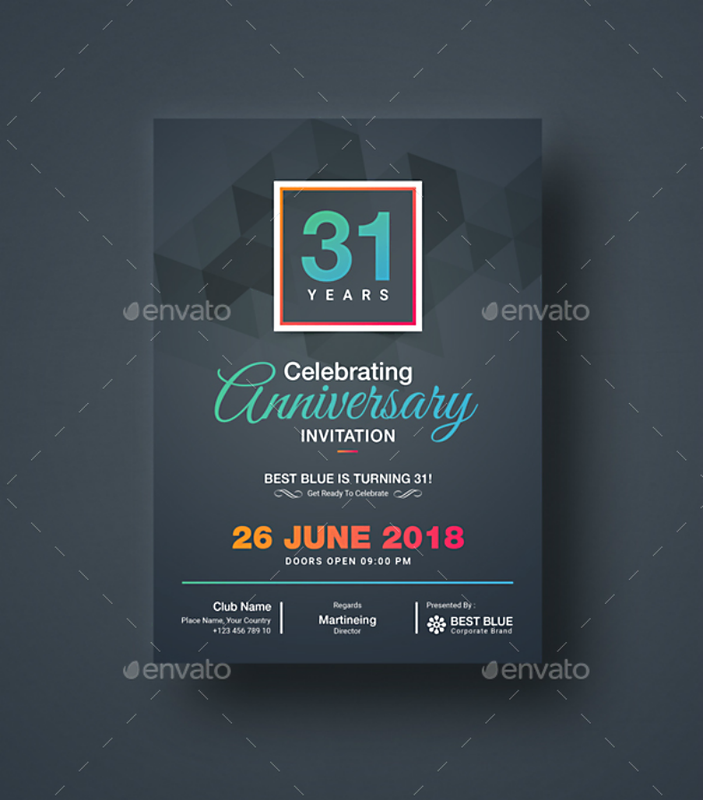 Here is another anniversary party invitation that is quite simple that it doesn’t have too many elements except for the typography and some other graphics. Starting from the topmost portion, it answers the “what” question which is then followed by a specification as to the number of years that the company has been in existence. Below those details are the answers to the when and where questions, as well as the name or the group who are involved in the planning of this event. As for the background of this design, it is a simple color gradient that gives the impression of a shiny material. 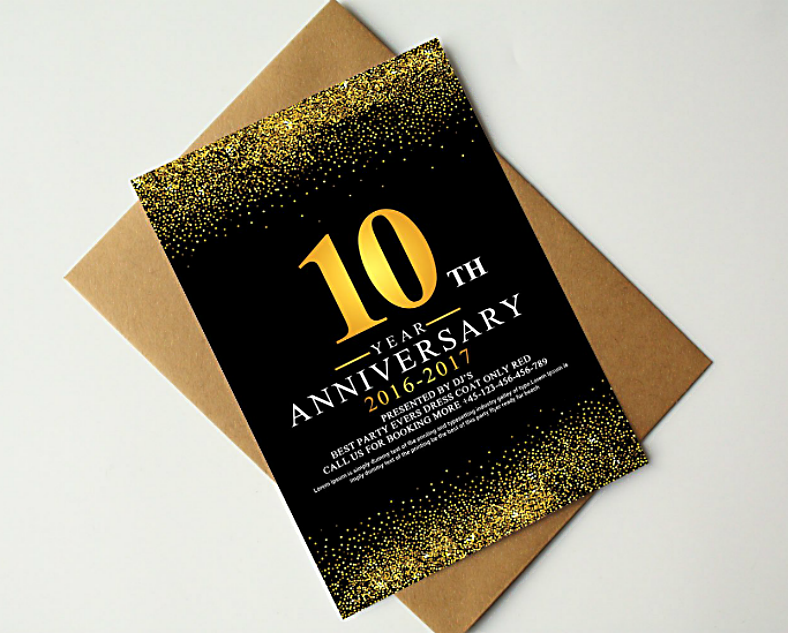 Make your anniversary invitation sparkling with this design, which makes use of both front and back sides of the card. While the front side of the card simply shows the number of years surrounded by gold glitter decorations, the back side is where the relevant information can be found. On the back of the card, the answers to the questions “what, when, who, and where” can be found and are written in a very unique way as well since the numbers are actually written in words. Check out this modern-themed invitation design that uses multiple colors to increase its level of appeal. With regards to the colors, the design is divided into three sections, with the top section bearing the color orange, light blue for the middle section, and dark blue for the bottom. Aside from just the colors, these three sections also hold specific information about the event to make it easy for the invitee to read. Chalkboard designs will never go out of style. There is really something about them that can effectively attract people, and you would probably agree upon seeing this chalkboard-inspired anniversary invitation. With chalkboard-inspired templates, you may be able to make your design look vintage or modern simply by changing the type of font that you will be using. For this design, the typeface used are serif and script, which is a good combination of fonts to make a design look retro. If you are into chalkboard designs, then this anniversary invitation may be a great choice for you. 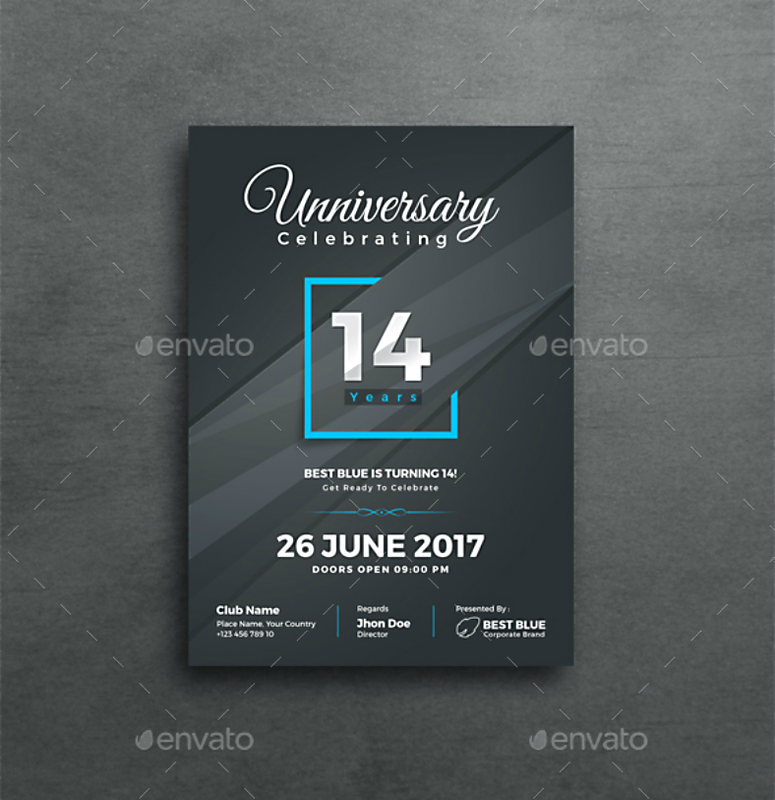 If you want your anniversary invitation to easily stand out, here is another design that is horizontally oriented, and the orientation itself is enough to make this invitation stand out from among the others. 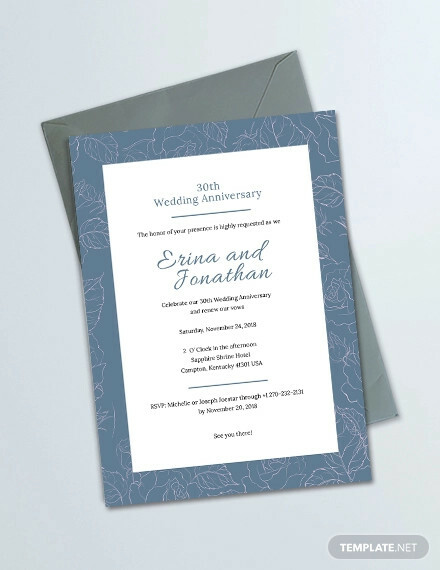 The details on this design are organized in a way that the details are very easy to read and to find, and having an organized arrangement of these features make the entirety of this anniversary invitation appear uncluttered. To prevent from making this design look dull because of the simplicity of the features, a textured background is added to the design. To provide you with inspiration, we also have a list of anniversary invitation ideas that you might want to check. 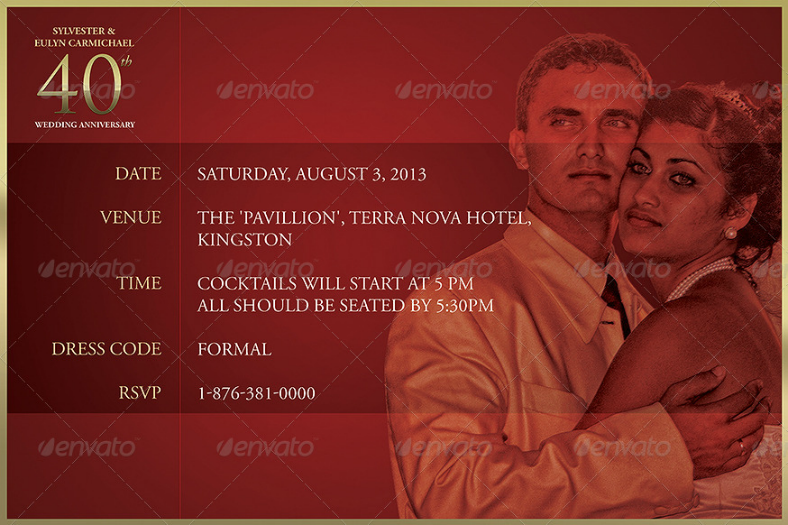 For a ceremony invitation that looks like a dramatic movie poster, the one above greatly fits that criteria. The front side of this invitation design simply shows an elegant design that contains some text with the number greatly emphasized, and these features are placed on a plain, solid red background. For the back side of this invitation design, the same image found on the front is shown but in a smaller scale and placed on the upper-left corner of the page. Below that are the relevant details about the event, which includes the date and time, venue, dress code, and the contact number for the RSVP. 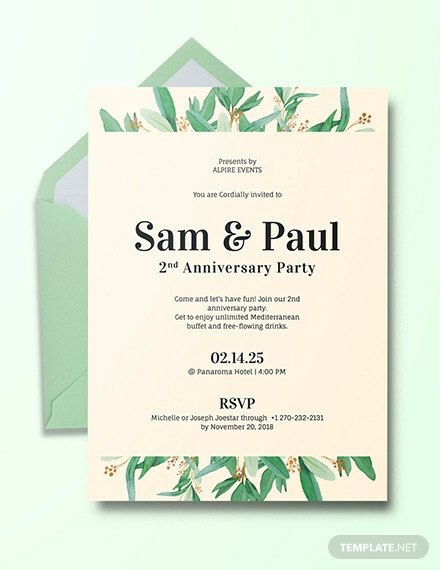 To make this invitation design even more interesting, you may be able to place an image of the couple on the right side of the page, but make sure to lower the opacity a little bit so as not to make the text difficult to read. Know the nature of the occasion since this can help in setting the mood for the invitation. When an invitee gets a copy of the invitation, they will already be able to determine the type of event that they have been invited to even without looking at the contents of the invitation. Make sure that the details written on the invitation are accurate and updated, you would not want to provide false or erroneous information to your guests. Though some would consider this an optional aspect of an invitation, it is best to include an RSVP to help you confirm the number of people that are sure to attend the celebration and give you enough time to prepare. 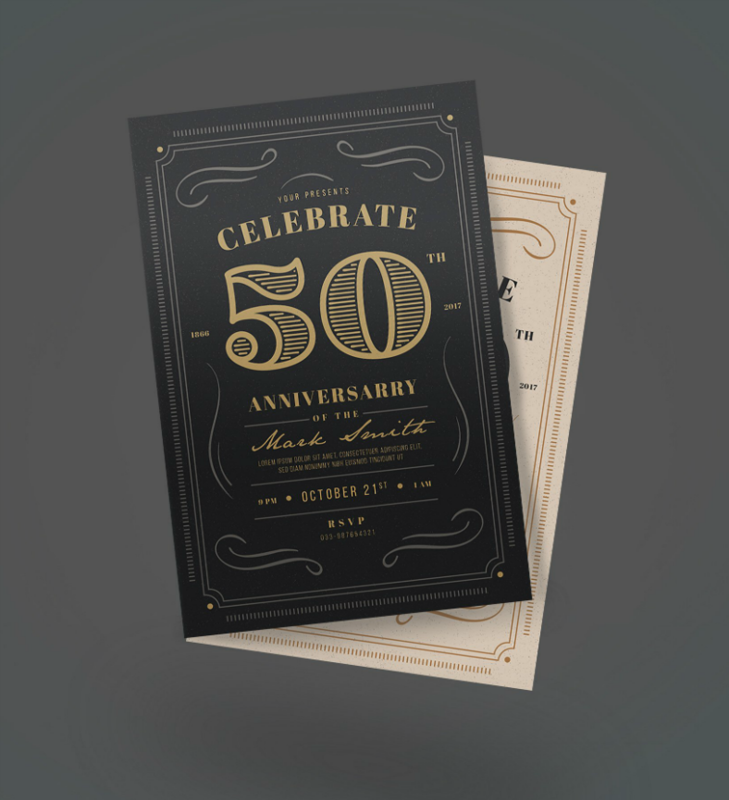 So what did you think of the anniversary invitation designs that we have shown you? 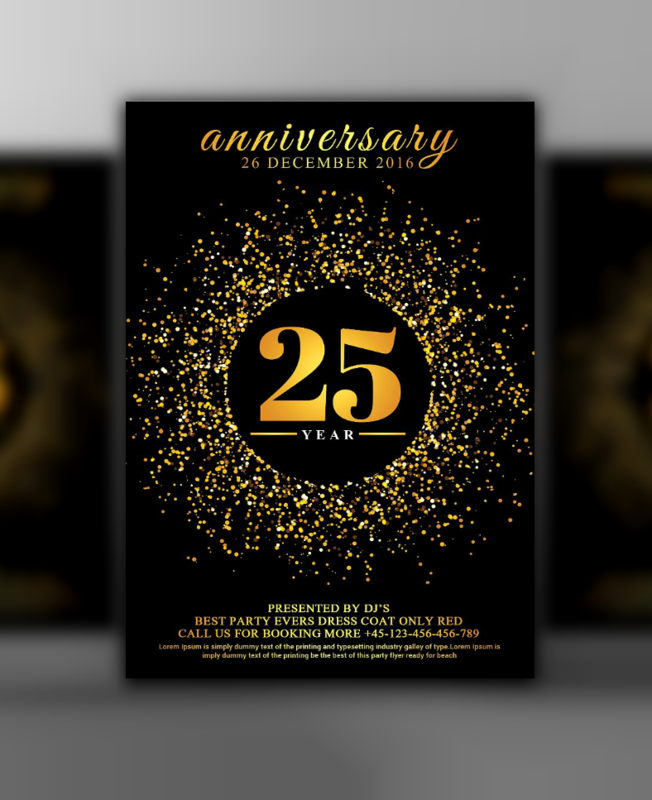 We sincerely hope you were able to find one that you are looking for because these anniversary invitation designs were carefully selected from among hundreds of the best one found on the Internet and from various reliable websites. 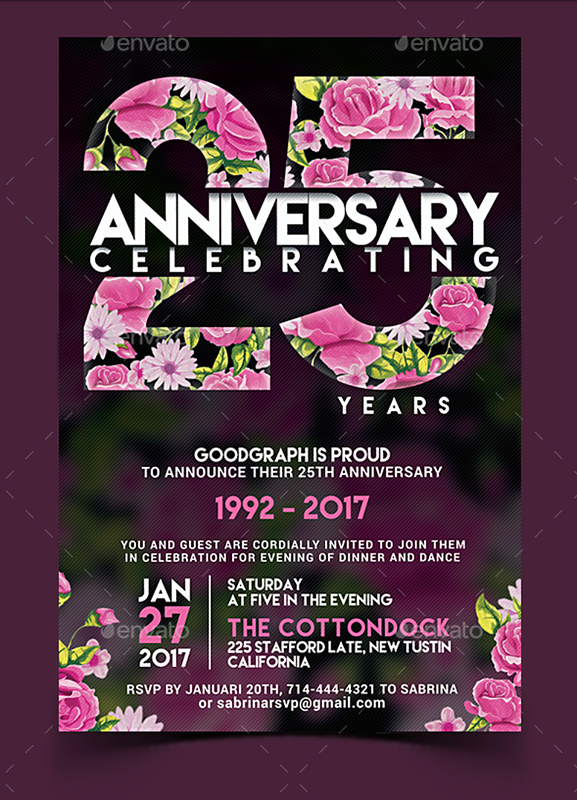 These designs were also created by highly experienced and skillful graphic artists with the intention of providing their clients with top-of-the-line anniversary invitations. 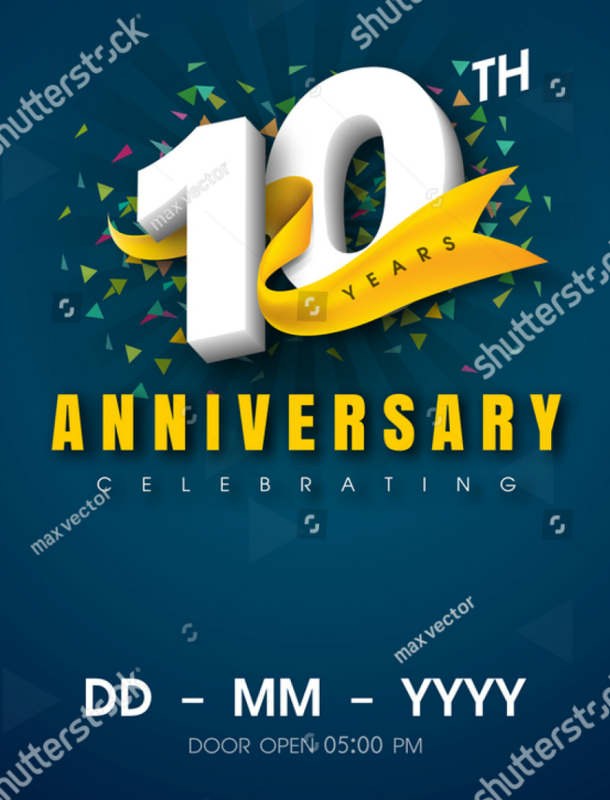 Downloading these designs can be done very easily, you simply need to look for the specific anniversary invitation that suits your preferences, click on the download/buy button, and pay the fee. 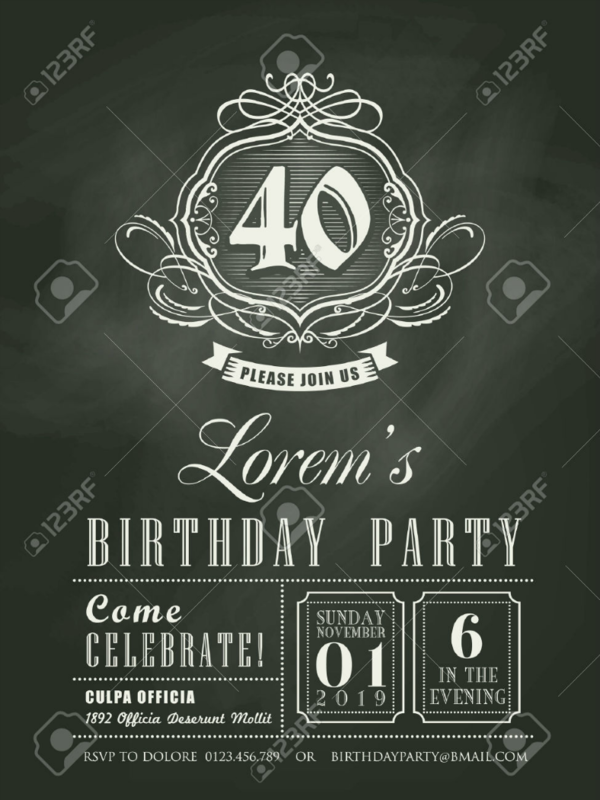 You may think that since these designs have a very reasonable price, the quality may not be as good as you would expect, but it actually doesn’t follow; the invitation designs on this page are of high quality and are also easily editable. If you need some guidelines, you may want to read the steps on how to design invitations, then you can take advantage of these designs so you can make the best anniversary invitation for your event.